SRINAGAR, Jul 20 2012 (IPS) - He dreamed of one day running on international athletic tracks and worked hard for seven long years to make this a reality. But today, despite Tanveer Hussain becoming the top athlete in the state of Jammu and Kashmir, his dream is quickly vanishing in the face of government apathy towards sports. “Every time I won a marathon, all I got was a pat on my shoulder and false promises. The government has never supported me even though I am (one of the) top athletes in the state,” Tanveer, a 12th-grade student, told IPS. 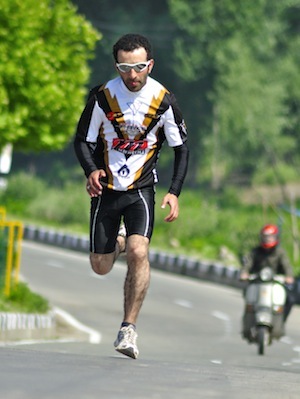 Tanveer has won numerous long-distance races, the most recent being the 42-kilometre Jammu Marathon organised by the Jammu and Kashmir Police, in which he outran 17,000 athletes. “The authorities don’t organise any sporting events; the only competitions are those hosted by local banks or the police. There are no avenues for me, or other players, to reach national or international levels,” Tanveer told IPS. A few weeks ago, Tanveer even ran a 100-kilometre “protest” marathon, but his action failed to move authorities. Tanveer is certainly not alone in his predicament. Scores of other athletes around Kashmir are faced with a similar decision: to follow their passion to master a sport, or give it up in favour of more “realistic” prospects. Eleven years of experience failed to fetch Riyaz Ahmad a professional career in cycling, forcing him to abandon the sport forever. He said a lack of infrastructure and inadequate funding kept him and other cyclists from achieving success. “We do not have a proper sports policy in Kashmir, which is a major drawback. There is no professional training, and no one to organise participation in different tournaments,” he told IPS. A dearth of coaches in the Valley is yet another deterrent, Riyaz added. Often, senior sportspeople are forced to train youngsters. “We don’t even have a proper athletics track,” he said. Almost all sportspeople in Kashmir are facing tough times due to government negligence. Experienced athletes are quitting in droves and disinterest in sports is rampant among youth in the valley. “Our children who want to make sports their career have no security. Sports is the last thing the government thinks of,” Nayeema (not her real name), an international-standard sportswoman hailing from the Valley, told IPS. Authorities have little to no interest in the condition of facilities or the quality of athletes, and funding is scarce, she lamented. The Jammu and Kashmir State Sports Council, an autonomous body responsible for providing funds to various sports associations and monitoring their work, is also tasked with organising tournaments, training players, upgrading infrastructure and providing all necessary assistance to sportspeople. Forty-eight associations are affiliated with the Council, and thereby entitled to government funding. Other non-affiliated associations, which numbers in the hundreds, receive no state subsidies. Through associations affiliated with the Council, each of Kashmir’s 22 districts is allocated just 10,000 rupees (about 180 dollars) for training junior, sub-junior and senior players of all sports. “We have hundreds of players from each district. How can this meagre amount suffice to train and support all our budding players?” Nayeema asked. Ironically, the chief minister of the state, Omar Abdullah, heads the State Sports Council. But “even after repeatedly pressing on authorities to improve sports in Kashmir, nothing is done. Our valuable talent and hard work is wasted,” Rashid Ahmad Choudhary, Kashmir’s international fencer, told IPS. Nayeema remarked that though the Sports Council disburses funds to associations, there is no monitoring on how this money is being used. “Whatever funds are released should be properly utilised. But with the condition of sports deteriorating, one wonders where all the money goes,” she said. According to the official sources, rampant corruption in virtually every aspect of civil and political life in Kashmir undoubtedly affects the sports arena as well. Afzal, an administrative officer of the Sports Council, admitted that inadequate funds have a negative effect on sports in the Valley, adding that the government has been asked to increase funds.